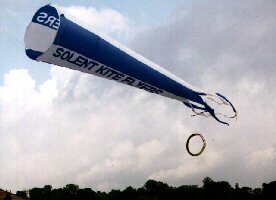 Solent Kite Flyers was formed in 1994 to provide a club for kite flyers in Southern Hampshire, the name reflecting that most members at the time lived within a few miles of The Solent, the name given to the stretch of sea that separates the Isle Of Wight from the mainland. The SKF logo also reflects the connection with the Solent, it is created by overlaying a delta shaped kite over the Solent area and modifying it slightly, as you can see in images below. Flying days are held on most Saturdays and Sundays of each month, weather and wind dependant. The Saturday gatherings are at Stoney Cross Common. The Sunday gatherings are at Stokes Bay. Although not official club flying days, the Bournemouth-based members can usually be found flying at Hengistbury Head most weekends and British Summer Time evenings, when conditions are good. We usually fly in the designated kite flying area, where the grass is kept shorter. Use the Contact Us page if you want to arrange to meet with us at one of these gatherings. SKF are involved in a number of the major kite festivals and other annual and one off events. 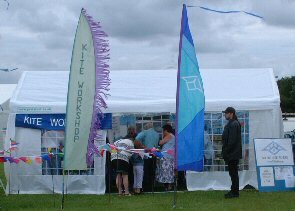 We also attend a few fairs and schools to soley run our kite workshop. See the Club Diary for details. The club have purchased 3 Idol fish designed by Robert Van Weers, to reflect our connections with the sea. 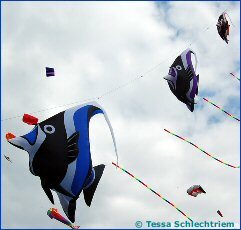 These fish had their first public showing at the 2006 Portsmouth Kite Festival. We also have a club windsock that makes regular appearances. Membership details can be found here.